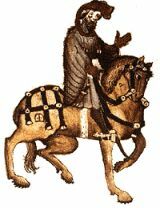 The first pilgrim Chaucer describes in the General Prologue, and the teller of the first tale.Tje Knigh represents the ideal of a medieval Christian man-at-arms. 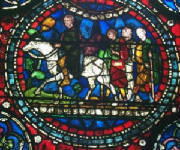 He has participated in no less than fifteen of the great crusades of his era. Brave, experienced, and prudent, the narrator greatly admires him. Theseus, duke of Athens, imprisons Arcite and Palamon, two knights from Thebes (another city in ancient Greece). From their prison, the knights see and fall in love with Theseus’s sister-in-law, Emelye. Through the intervention of a friend, Arcite is freed, but he is banished from Athens. He returns in disguise and becomes a page in Emelye’s chamber. Palamon escapes from prison, and the two meet and fight over Emelye. Theseus apprehends them and arranges a tournament between the two knights and their allies, with Emelye as the prize. Arcite wins, but he is accidentally thrown from his horse and dies. Palamon then marries Emelye.